Spotify reckons that automatically publishing playlists is the best way to get the music out there, but you don’t want this automatic publication to happen in every case. Similarly, you may not want people to know what your top tracks and artists are, and that’s fair enough. After all, music is wonderful for sharing, but there might be times when you want to keep things private. Choose File➪Preferences to go to your Spotify Preferences pane. In the Profile section, select your publishing preferences. By default, the Automatically Publish New Playlists is selected. Deselect the check box to turn this functionality off. While you’re here, if you don’t want your Top Tracks or Top Artists made public, then also make sure that these boxes aren’t checked. Click your name at the top-right of the Spotify window. Select Profile from the drop-down list that appears. The top of the screen displays the words Your Public Profile. 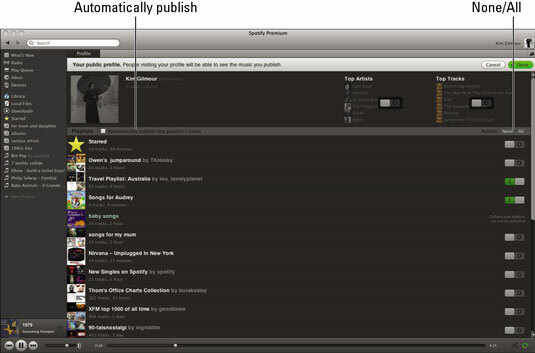 People Visiting Your Profile Will Be Able to See the Music You Publish. Click the Edit button next to this notice. Your profile now becomes editable, and your playlists appear in a list. You can toggle which elements of your profile you want to make public or private while in this Edit mode. To select a playlist that you’re happy to share (or deselect one you aren’t), click the On/Off switch next to the playlist. If a switch is set to green, the playlist is public. Click Done at the top of the screen to finish the process and save your settings. If you want to start over, click Cancel. Your profile appears in the window after you click Done and is displayed as it appears to others. 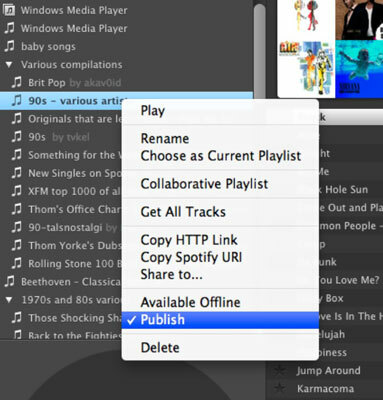 Should you be in a sharing (or non-sharing) mood later on down the line, there’s a quick way to publish or unpublish playlists. Just right-click (Command-click on a Mac) a playlist from the left sidebar and select (or deselect) Publish from the pop-up menu that appears. This pop-up menu also gives you an easy way to tell whether a playlist has been published — it has a check mark next to Publish if it has. While editing your profile, click the All link, located above the column of On/Off switches, to publish all your playlists at the same time. Alternatively, click None to unpublish all playlists. Make sure you choose the right option!